This week I started a devotional by Ann Voskamp called the, “One Thousand Gifts Devotional: Reflections on Finding Everyday Graces”. Already, there is one thing that has stood out, that we have taken the idea and the meaning of thankfulness for granted. The words thank-you is something we train our kids to say, we call it one of the “magic words”. As we grow older it’s an automatic response, it becomes something we say without thinking and not always mean. Since it is such a common word I don’t think we teach our kids, or always understand for ourselves, what the word actually means or the power and impact it can have. glad that something has happened or not happened, that something or someone exists, etc. A few synonyms of thankful are: pleased, relieved, appreciative, and grateful. When we are not thanked, we certainly notice. When we are not thanked over a period of time we begin to feel taken advantage of. There is as much power in not saying thank you as there is in saying it. We instinctively understand the value of the word which is why we work so hard to train our children to use it. Maybe it’s time to teach them, and us, the why behind expressing thankfulness beyond simply being polite and having good manners. Like mentioned earlier, we certainly notice and we feel taken advantage of when we are not thanked. If we feel that way, how does God feel when we do not spend time thanking Him for all his provisions? That thought really struck me, it should give us all serious pause. The Psalmist repeatedly calls us to give thanks to the Lord for two things: His loving-kindness, and for his miracles among men. This isn’t just a polite “thanks” for when something good happens. This is an outpouring of praise to God for who he is and what he has done. 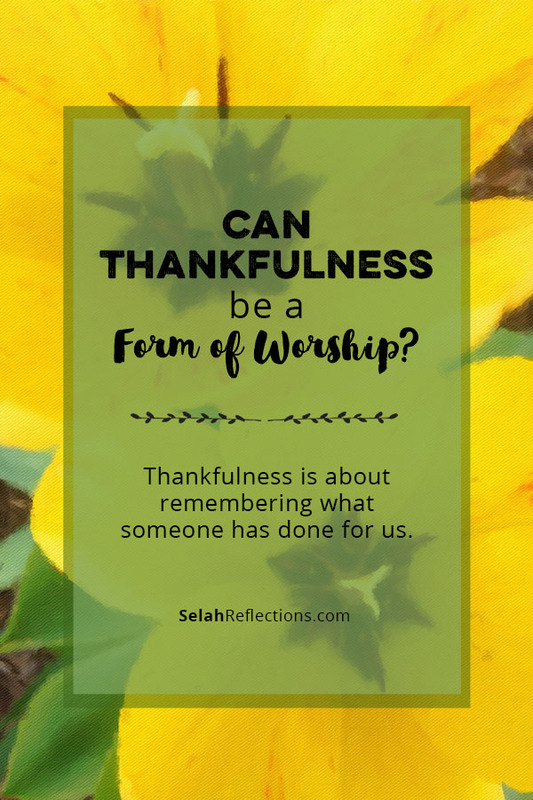 Thankfulness is about remembering and acknowledging what someone has done for us. We have so much to be grateful for in what God has done for us already, is doing, and will do for us. But, still, it’s all to easy for us to forget. Before we jump on the thanksgiving bandwagon, we need to realize that genuine thankfulness is inextricably bound up with trust. We will never truly thank God until we first truly trust Him. We will not be grateful to God for all that we have until we first recognize that we’re dependent on Him for all that we have. When we combine thankfulness and trust in our Heavenly Father, what an incredible expression of worship. Since it is so easy to forget, it becomes important that we find ways to cultivate a habit and an attitude of thankfulness. This morning I realized I hadn’t written out my “I’m thankful for” list during my daily devotions for quite a while. By not writing out that list each day it was beginning to impact my thinking. It also tends to make me blind to what is happening around me each day. While in my photography I still look for the small moments, celebrating His creation, I was missing the “everyday graces”, the moments where God shows up day-in and day-out. We have to be purposeful in our pursuit of cultivating this habit, so here are a few suggestions that might help. In my devotional journal I start each session listing 3-5 things that I am thankful for. Big, small, or seemingly insignificant, it doesn’t matter, write out your list each day. A tool like this can help us remember to be “thankful in all circumstances”. As the saying goes, “garbage in , garbage out”. So let’s fill our hearts and minds with the ideas, thoughts and commands about thankfulness. Listed above is a collection of verses that talk about thankfulness, for a more complete list, click here. Taking the time to put pen to paper in order to express our heartfelt gratitude for the blessing someone has been in our life, is a beautiful gift we can give in return! The practice is intended to be a way of cultivating a habit, of learning to live praise, to make gratitude and joy your default, to move thanksgiving away from a holiday to a lifestyle. 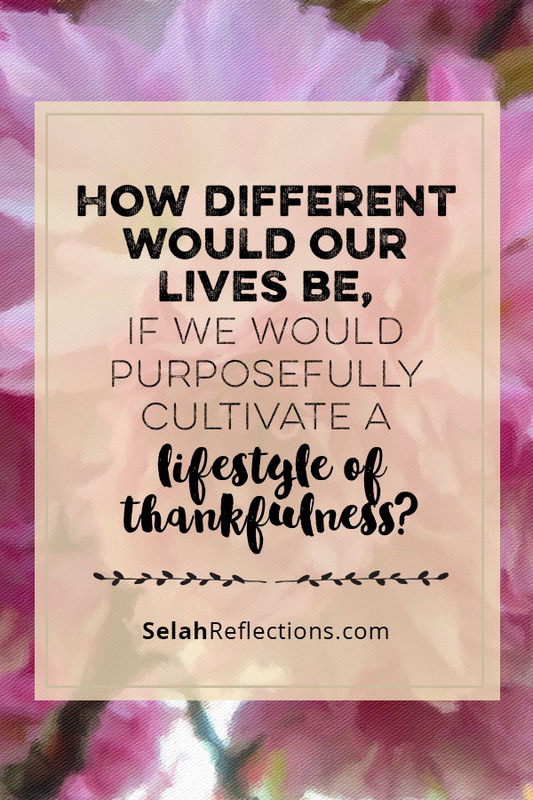 How different would our lives be, how could we change the lives of those around us if we would purposefully cultivate a lifestyle of thankfulness? A lifestyle of not forgetting all that God does for us each day. Focusing on what you are thankful for keeps your heart and your mind in the right place. Thank you for the reminder Miss Marta. I need the reminder myself!! It can make such a difference in my day.